for you, and also offer complete restoration work. These replacement glass eyes will fit most Steinbach full sized nutcrackers and come connected with a wire fused into each glass eye. 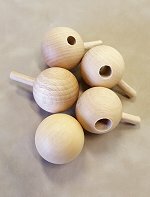 Designed to be cut with wire cutters to leave a short stem which inserts into the nutcracker and helps keep the eye in place. Sold in pair & available 3 Colors: Dark Blue, Brown and Aqua-Marine Blue Each Eye is about Ø 3/8 inch - 10 mm in diameter. Made in Germany by Steinbach Volkskunst, GmbH Marienberg, OT Gebirge, Germany Sorry - Dark Blue are Currently Out of Stock! Please check back later in 2018. 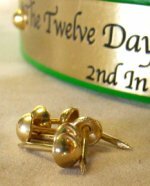 These are the original round headed tiny brass pins that Steinbach uses to attach the engraved nameplates to their limited edition nutcrackers. Sold in pairs Made in Germany by Steinbach Volkskunst, GmbH Marienberg, OT Gebirge, Germany In Stock!